Have you been thinking about becoming a Filipino TEFL teacher but feeling unsure how to get started or where to find the best TEFL certification for Filipinos? No matter if you've been dreaming about the shimmering beaches of the Thai Islands, the snow-topped peaks of the South American Andes, the happening cities of China, or the cultured towns of Mediterranean Europe, TEFL is your ticket to travel the globe. Yep, simply by making use of your language skills in English, you could soon be gorging on pizza in Rome or unraveling the mysteries of the Argentine gauchos – all while earning as much as $2,000 USD a month! Here are some of the most frequently asked questions about TEFL teaching for Filipinos, that we’ll be answering for you in this complete article on how to be a Filipino TEFL English teacher. 1. Can a Filipino be a certified TEFL teacher? Yes, a Filipino can be a certified TEFL teacher! What you need is a strong, fluent command of the English language, especially English Grammar, and to be a certified Filipino TEFL teacher. If you're having issues with your grammar then check out Grammarly too, a website that could help you proofread your work or your lesson plan! 2. How can I become a certified Filipino TEFL teacher? You can become a certified Filipino TEFL teacher by enrolling in a suitable, accredited TEFL course for Filipinos. There are many types of TEFL courses out there, both classroom-based and online. 3. What is the best TEFL certification for Filipinos? The best TEFL certification for Filipinos is an accredited TEFL course which teaches every aspect of teaching the English language to the highest standards possible. Online TEFL courses for Filipinos usually offer the best value for money, whilst preparing you fully to be great TEFL English teacher. There are so many TEFL courses out there, so we have chosen to recommend myTEFL because we know them well, they are properly accredited, and they offer lifetime job finding support to all Filipino TEFL teachers. Your online TEFL course should be at least 100-120 hours to satisfy most employers. 4. Where is the best place to be Filipino TEFL teacher? The best place to be Filipino TEFL teacher is Vietnam, or Peru, or Spain, or China, or …just kidding! The best place to be Filipino TEFL teacher is the place which makes ticks as many of your ‘dream-life-boxes’ as possible. It is the place that makes your heart beat with excitement and anticipation when you picture yourself waking up there every day. Remember, you’re doing this for a reason - to live the life you want to live! 5. 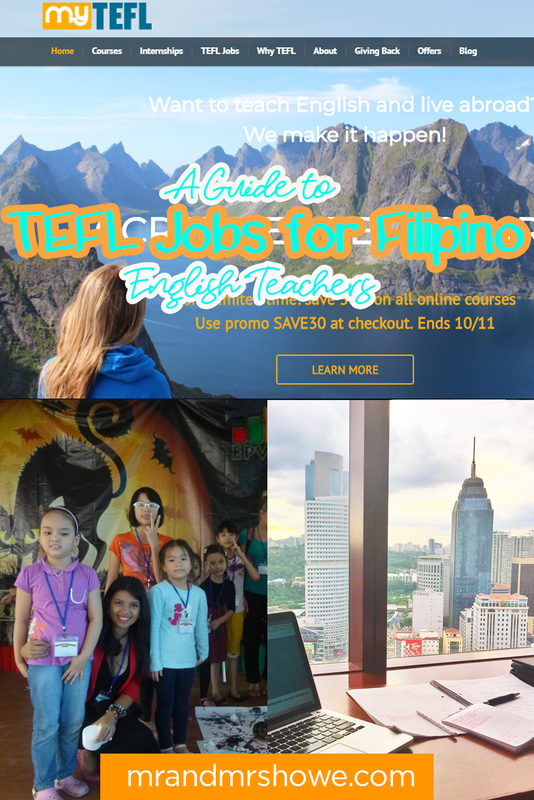 How much money does a Filipino TEFL teacher earn? A Filipino TEFL teacher can earn ‘up to’ $2000 USD per month. Having said that, this number is the upper-high-end, and your earning potential will depend on a variety of factors, such as; country, experience, skill level, school or institution and your own ability to sell yourself. Aiming to earn $800 - $1000 USD per month at the beginning of your TEFL career is reasonable, but remember there are many variables to consider. 6. How can I make my TEFL resume stand out to employers? You can make your TEFL resume stand out to employers by following some simple key rules, for example; choose a clean look and simple design; include a professional-looking headshot (especially in Asian schools), and tailor your resume for each application. Read the whole article for more resume tips! 7. How can I find a job as a Filipino English teacher? To find a job as a Filipino English teacher, you should start contacting potential employers before you arrive in your chosen country but don’t sign any long-term contracts right away. This helps you to build your network before you arrive. And remember, myTEFL also offers job finding support. Read the whole article for more advice below! 8. How can I find students as a Filipino TEFL teacher? You can find students as a Filipino TEFL teacher in a variety of ways; promoting yourself; connecting with other Filipino TEFL teachers; making use of online forums and being proactive in creating work for yourself. 9. How can I improve my salary as a Filipino TEFL teacher? There are many ways to improve your salary as a Filipino TEFL teacher, but the most important are to build your experience as an English teacher, then you can start to specialise in teaching private students at a higher level and for international qualifications like IELTS, PCE and TOEF. 10. So how do I get started to become a certified Filipino TEFL teacher? If you think that you’ve already read enough and you’re ready to get started in your new life as Filipino TEFL teacher, then go ahead and start planning! If you're not quite ready yet, then keep reading below for loads more detailed advice on becoming a fully certified Filipino TEFL teacher! The first thing you'll need to be a Filipino TEFL teacher is an accredited TEFL certification for Filipinos, which allows you to enter the classroom and teach the language you know so well. You'll be imparting knowledge about everything from vocabulary to grammar, and have a choice of schools right across the planet. What's more, Filipino English teachers are widely considered to be some of the most sought-after on the globe, with a high standard of fluency and strong work ethic just two of their greatest strengths. So, with high salaries, awesome destinations, steady and rewarding work, and enticing relocation packages all often part of the package, what are you waiting for? It may seem a little obvious, but the first step for all budding Filipino English teachers is to get qualified. There are oodles of different TEFL courses out there, from short introductory courses to more comprehensive courses that leave you with the full certification and ready to enter the classroom. You can expect to be trained in everything from English grammar to class management techniques. And by the end of it all, you'll be perfectly placed to show others the intricacies of past tenses and pronouns, all while effectively keeping students engaged. Online courses tend to be the best value for money, allowing would-be teachers the chance to bag a fully-accredited qualification at their pace and with constant support over the web. There are countless TESOL courses in the Philippines and TEFL schools in the Philippines that offer these sorts of certifications, not to mention plenty of web-based companies like myTEFL that have similar remote courses. People always want to know which course we think is best, but there is no way to answer that as we cannot check them all out. In theory, a TEFL qualification allows you to move anywhere you'd like, from the snow-topped Alps to the deserts of South America - so long as the place, you intend to go requires teachers, of course! However, there are some things to consider before you pin your hopes on a particular destination. 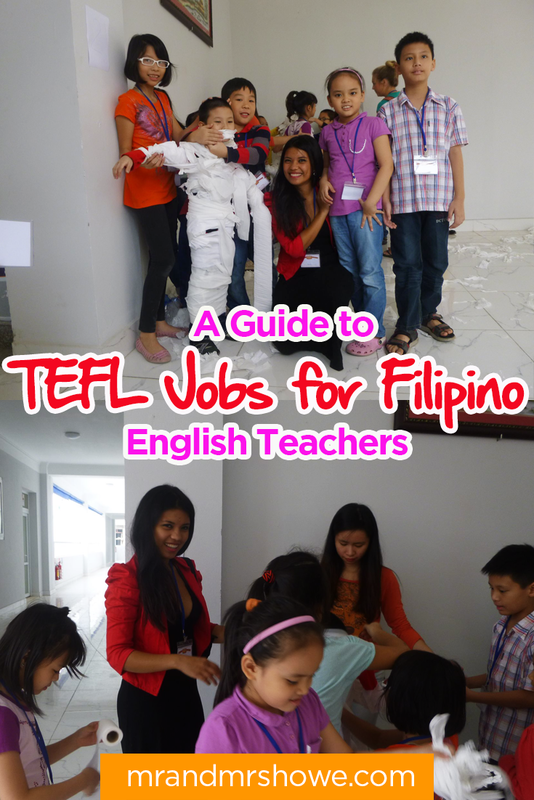 Firstly, think about what countries have the most English teaching jobs for Filipinos. For example, places like Vietnam and other sun-kissed tropical gems in Southeast Asia are experiencing hefty demand at the moment. Secondly, consider where in the world makes it easy to get all the necessary documents sorted. TEFL jobs for non-native speakers often require working visas and permits, and where you choose to go will depend on heavily on which countries are easy to access for would-be Filipino English teachers. Once you've bagged that all-important TESOL certification for Filipinos, it's time to bulk out the CV with experience. Ask any successful teacher, and they'll tell you just how important it is to approach potential employers with teaching time already under your belt. Not only will it highlight a level of professionalism and aptitude, but also show just how dedicated you are to your new career. You can get valuable experience in the world of TEFL teaching by volunteering at local schools, by offering to tutor friends and family members, or by doing online teaching work (which you might even get paid for along the way!). All of this will add value to your job applications, and help get you on the road and in the classroom in no time. Ah, the dreaded CV. A single document to sum up all your skills and experience as a teacher? It’s certainly a hard ask, especially when recommendations say to keep the whole thing under two pages! However, there are some good ways to ensure your CV (the same thing as a resume) is terse, to the point, and effective. A clean-look, simple design is important, while clear contact details and a professional-looking headshot (especially in Asian schools) should be added to the top of the document. From then on, the less wordy, the better – CVs are intended to convey all your experience and work at a glance, after all. For all the detailed stuff and more personal introductions, you can feel free to attach a separate cover letter, which should be tailored to the particular position you're applying for. That means reworking your CV for every new application, focusing on your experiences with younger learners for primary schools, or isolating your great grammar skills for higher-education institutions. Thankfully, many TEFL providers will offer services like myTEFL's post-qualification support, which can help hone that CV into something headmasters simply can't refuse. We all know the saying: nothing comes for free! Well, it's the same in the world of TEFL folks. If you really want that job of a lifetime teaching English abroad, then you're going to have to go out and look for it. That means making lists of schools, teaching institutions and private tuition providers in your chosen destination. It means writing focused CVs and cover letters for each, and contacting the headmasters or head of studies individually to enquire about opportunities and work. Don't be disheartened if you feel as though you're not getting anywhere. By contacting potential employers before you even arrive in a country, you're already doing way more than most all other Filipino English teachers on the market. At worst, you'll find you have a good network of contacts already built when you arrive. At best, you may just nail yourself a position. (Just be wary of signing long-term contracts before you've had a chance to see what a place is like on the ground.) Oh, and don’t forget that TEFL providers like myTEFL offer job finding support to all graduates for life! It's worth remembering that once you've dusted off one of those TEFL courses in the Philippines or completed that online TESOL qualification, the likelihood is you'll be moving away from home to teach. That can be a cataclysmic change and means leaving behind all your friends and family for an adventure elsewhere. Don't panic! There are plenty of support systems in place, with Facebook groups and expat communities online eager to help you settle in and make friends in your adopted home. What's more, reaching out to these networks, and discovering the ins and outs of the TEFL scene in the destination you've chosen, can also help with that all-important job search. As you make more friends and alert more people in the industry that you're looking for a position, it's all the more likely that news about placements and teaching positions will trickle down to you. So, reach out, talk to others, send messages and ask questions – the process can only help in the search for those perfect TEFL jobs for non-native speakers. Don't be scared to go full-throttle on the self-promotion front. All effective Filipino English teachers will do this! Make posters, reach out to Facebook groups of English learners in your chosen destination, leave fliers around schools, ask your pupils to spread the news about your tuition by word of mouth, start a website, and advertise online. All of these efforts will help you build up a wide base of potential students, and should – eventually, at least - help keep the cash flowing in. Online TEFL providers like myTEFL and many TESOL schools in the Philippines will offer guidance in proper practices when it comes to self-promo. They can help you get to grips with the most effective ways to contact potential students and show what advertising methods are most appropriate. Oh, and always be sure to check your promotional activities are legal too – some countries simply don't allow private tuition and one-on-one classes. Last but certainly not least comes the chance to specialise in a particular area of TEFL teaching. Most commonly this will take the form of exam prep, as you take on private students who are looking to succeed in a particular EFL qualification. And boy are there oodles of these! From IELTS to PCE, TOEFL to Cambridge exams, the acronyms and niches are pretty much endless. And that means the opportunities for Filipino English teachers are pretty much endless too! Yep, opt to specialise as a teacher in one of these exam courses, and you could really boost your income from private students. You'll have to remember to advertise your new direction and showcase your certificates in the area. But once you do, it's all about cranking up the price of those one-on-one lessons, not to mention enjoying a new type of tuition with a focused direction and clear goals! So, are you ready now? Then go ahead and get started planning your awesome new life as a fully certified Filipino TEFL teacher! Can you think of any more tips and tricks for those people looking for English teaching jobs for Filipinos or TEFL jobs for non-native speakers? What are your experiences of TEFL schools in the Philippines and TEFL courses in the Philippines? Have you taken a TEFL course for Filipinos and have some valuable insights into the profession? We'd love to hear about it all in the comments below. The 40% Discount with the Promo Code 2MONKEYS.